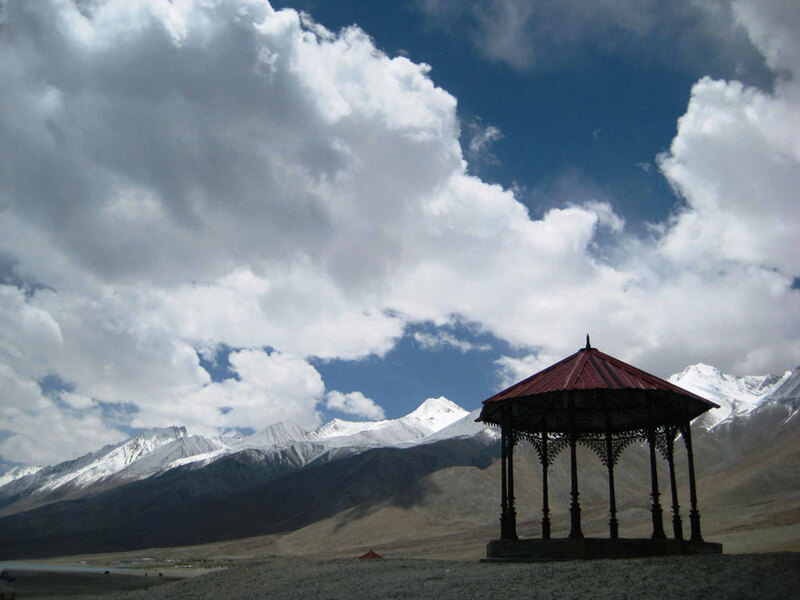 Here's a 7 night Leh & Ladakh tour package that flies you from Delhi to Leh. All our itineraries can be customized to your preferences and comfort levels. There are two ways of getting into Ladakh- either fly directly into Leh from Delhi or drive up from Manali. (You can get to Manali from Delhi by air, or by car, or an overnight deluxe bus.) Itinerary 1 involves the driving option, Itinerary 2 below flies you in. Ladakh also offers some unbeatable trekking opportunities- from gentle 2/3 day treks out of Leh to more rugged trips of up to 2 weeks. So pick your comfort (or tolerance!) level and send us a message. Fly from Delhi into Leh. Keep your camera ready in the flight for some dramatic pictures of the snow-capped Himalayas. Leh airport is at 3,256 metres (over 10,600 feet) and you will feel the difference at once. To acclimatize yourself, it's advisable to walk slowly and take it easy for the first day or two. Check into your lovely hotel- The Kaal- built in the traditional Ladakhi style with carved windows and prayer rooms with exquisitely carved wooden furniture. The atmosphere is homelike, the food is great and it's a short drive from the town centre. 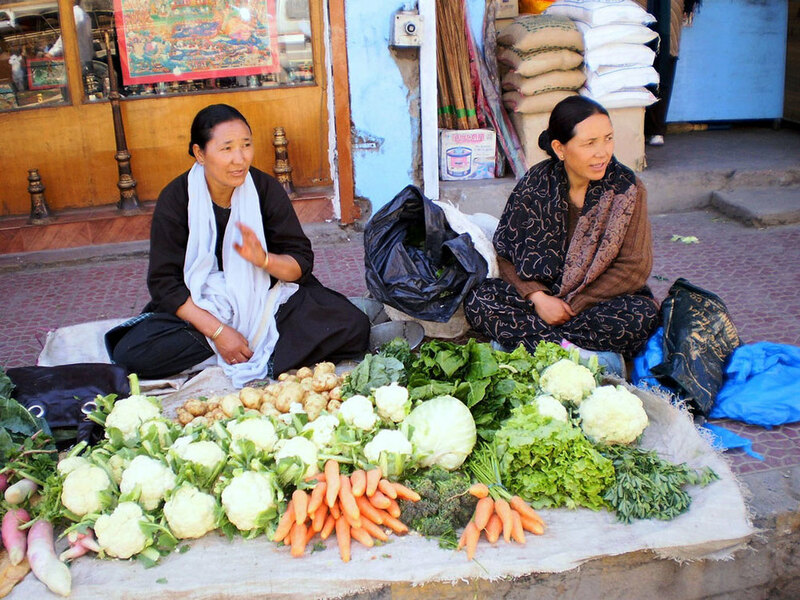 You can visit the Leh market later in the evening. Rest and acclimatize. Overnight Leh. Visit the Shey, Thiksey and Hemis gompas (monasteries). It's a full day trip with about 100 km of driving- but still an easy trip for the first day. The colourful monasteries of Ladakh with their scroll-paintings (thankhas), carvings, Buddha statues and stunning locations are an artistic and beautiful experience. Return to Leh in the evening. Overnight Leh. 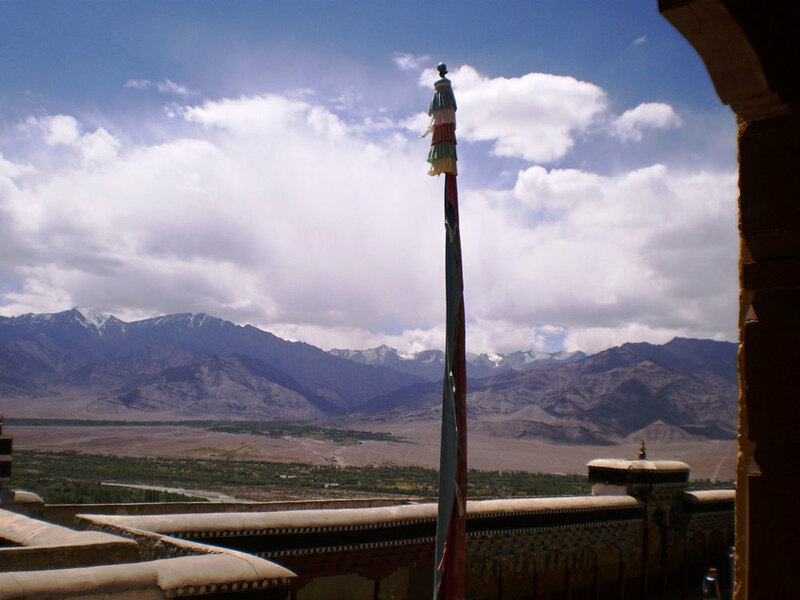 Drive to the Alchi monastery, 75 km away, visiting some interesting places like Rizong Gompa en route. 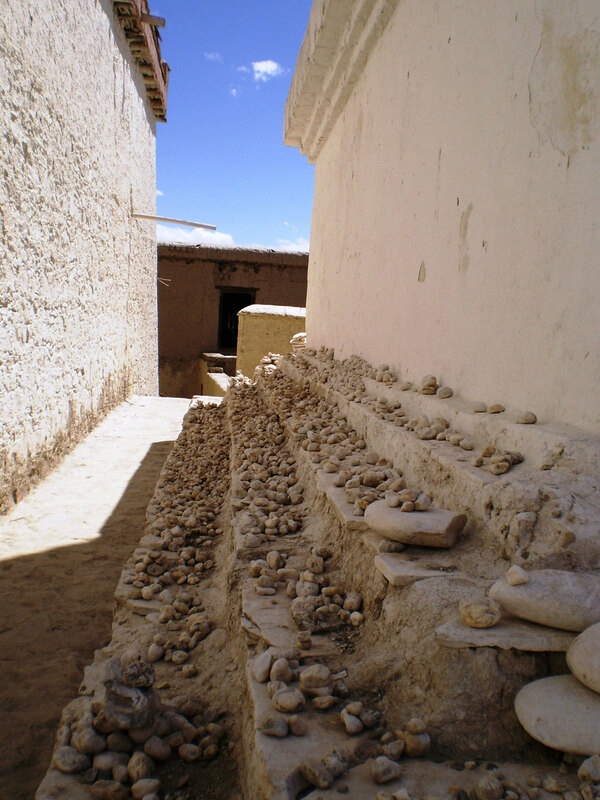 Alchi is the oldest monastery in Ladakh. Take a torch- it's dark inside and you don't want to miss the ancient statues and paintings on the walls. Cameras are not allowed inside the inner sanctum, but you can take pictures outside. The walls outside are full of dramatic paintings done in the traditional Ladakhi style. Overnight at the Uleytokpo Camp at Alchi. These are beautifully designed camps with tents for two people and have modern washrooms. Drive back to Leh via Lamayuru. The landscape leading to the Lamayuru monastery is known to resemble the moonscape, with its craggy hills and rock formations. The view from the top of the monastery is definitely other-worldly! Overnight Leh. An early morning start for the beautiful Pangong Lake, 215 km (5 hours) away. This is a long and magical drive over mountains, through a river bed, later crossing the Chang La pass at 5360 metres. There are snow-capped mountains all around and it can get pretty cold. Pangong is a ridiculously picturesque lake with many dramatic shades of blue and crystal-clear waters. You have the option of spending one night at Pangong, or return to Leh. 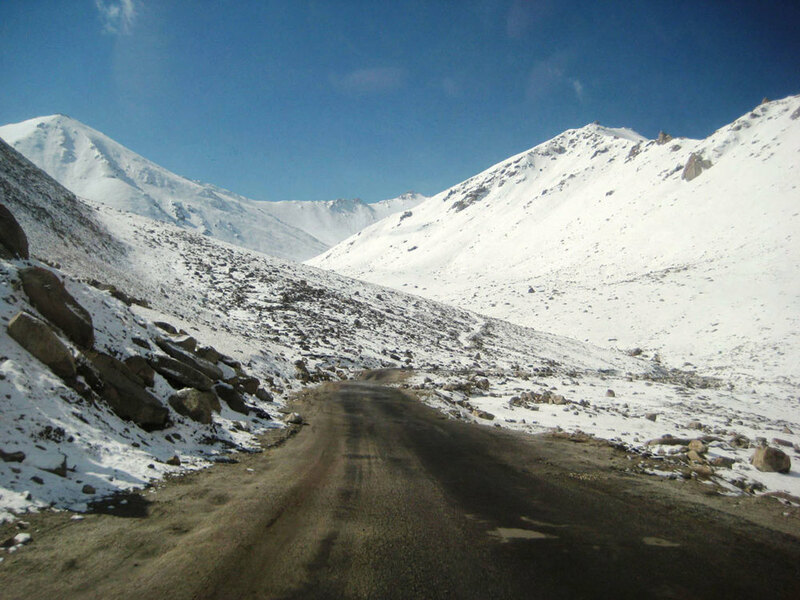 Drive to the Khardung La pass- the highest motorable road in the world at 18,380 feet. The road is well maintained by the army and the view as you keep going higher is amazing. Enjoy that top of the world feeling! Drive back to your hotel in Leh for the night. If you're up to it, climb the hill up to the Shanti Stupa. Otherwise it's an easy day in Leh today. Overnight Leh. Catch your flight from Leh to Delhi and move on to your next destination.